LIBATION's 11 YEAR ANNIVERSARY PARTY!!! On Friday, April 21st, one of NYC's nightlife staples will achieve another milestone! 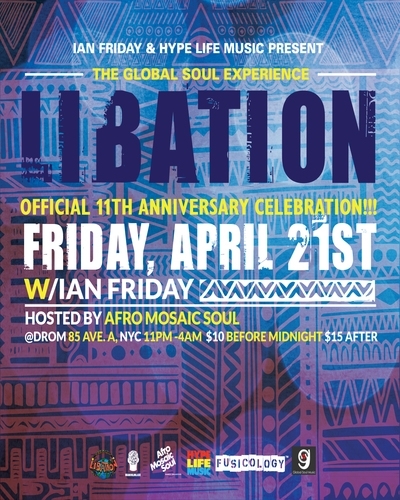 LIBATION, the long running party dubbed "The Global Soul Experience," will celebrate its 11 year anniversary with a incredible night of music and dancing that you won't want to miss!!! Acclaimed resident DJ, producer and remixer IAN FRIDAY (Global Soul Music) will helm the decks all night long. Also, the Brooklyn based collective known as AFRO MOSAIC SOUL (Ebony Beautifly, Steph Wiley, Scott Camodity, Deborah Conton and Brian Polite) will be on hand to host what will be an amazing night at DROM! » Are McCanns soliciting bids for exclusive 10th anniversary interviews?